“In two new middle-grade novels about modern tweendom – with LGBT themes – feisty young protagonists face grown-up problems with strength and conviction…. 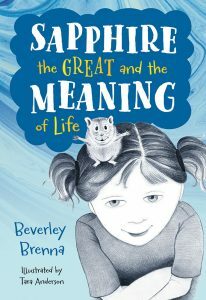 Written by award-winning Saskatoon author Beverley Brenna, and illustrated by Tara Anderson, Sapphire the Great is full of zest….Throughout the novel, the theme of gender-nonconformity is present without being explicitly broken down or didactic…. This is a touching and funny story mainly about a girl and her new hamster, but it is also about a family dealing with significant change….The story teaches acceptance of differences and of being who you are. These themes are presented in an age-appropriate and sensitive way….The book grabbed me right away and had me laughing at the end of the very first chapter. The chapters narrated by Sapphire are amusing, I loved the stream of consciousness feel as Sapphire finds her way in the world and tries to figure out the meaning of her life….Almost every illustration at the beginning of each chapter is the hamster character, these are excellent black and white pencil drawings which illustrate the personality and emotion of the animal…. “Sapphire the Great and the Meaning of Life is far greater than a story about a girl getting a pet hamster. It’s about struggling to find your place. Jeannie is a pretty good caregiver for Sapphire but she’s trying to figure out why her father isn’t keeping in touch, whether her parents are ‘getting put back together’ (pg. 40), why her little brother seems stressed, how to be a friend, why her Mom’s new friend Anna Conda seems reserved though really cool, and the questions that kids want answered but no one will respect them enough to tell them the truth. Meanwhile Sapphire is recognizing how nice her new home is, singing when pleased, and beginning to understand freedom, especially after a dangerous escape outdoors in frigid January…. It’s perfect that Jeannie’s story and Sapphire’s come together to become something bigger and better. Just as the two are better for having each other in their lives, Beverley Brenna’s text is enhanced with the adorable illustrations by Tara Anderson which head each of the forty-two chapters…. “This children’s novel is told from two points of view. One is that of nine-year-old Jeannie….The other point of view is that of Sapphire, the hamster that Jeannie gets….We watch how Jeannie struggles with her own feelings, sometimes erupting in frustration, anger, or sadness. And we watch how spending time with Sapphire calms her, and others in her household. The idea of freedom extends beyond Sapphire into others in the story, who are struggling with the freedom to be who they really are, despite how others may react to them. It’s about being able to have that freedom to be comfortable in your own skin, to be happy with your life, and to see that life in a positive way….